When I was young, it was not uncommon for a young man to present his inamorata with a mix-tape. For those of you born in the digital age, a “mix tape” was a sort of musical love poem, a cassette tape on which we would record a collection of songs meant to express our inner longings, our devotion, our hopes and dreams of love. Today, you have iTunes playlists and links to Spotify, but back in my analog youth, it took more work than a few drag-and-drops. I spent days searching through my album disks–vinyl LPs and ceramic 78s–making notes about the songs. I would listen to the end of one song and then play the beginning of another to see if the keys and tempi meshed. I calculated the run time for each song, reshuffling and discarding and reconfiguring my list so each group would fit on the 30-minute side of a 60-minute cassette tape. Thus prepared, I purchased a new BASF chromium dioxide (CrO2) cassette, cleaned the rubber wheels on my old Bang and Olufsen turntable, installed a new stylus, wired my receiver’s stereo output to the line-in jacks of my cassette recorder, and got to work. Each song was laid down with care and precision. I set the cassette on Record/Pause, gently placed the needle near the end of the previous track, watched it closely in the grooves and, as it traversed the gap between tracks, released the recorder. Then I listened through the song until the last chord faded and hit Pause before the next track started. Change the disks. Clean and dust the grooves. Repeat. The woman I was wooing lived in Sausalito, an enclave of liberal Bohemian lifestyles second only to Berkeley, across the Bay. Our context was the vestiges of the ’60s civil rights and women’s lib movements, a decade of war bookended by assassins gunning down our cultural icons. Our music was folk, classical, acid rock, and prog. Our worldview was colored by Greenpeace, Earth Day, Three-Mile Island, and Superfund sites. I began the mix-tape with a cut from Songs of the Humpback Whale, labeling it “Grampus Yodeling” (completely unaware that grampus refers to the orca, not the humpback). From whale-song, I faded to a track of Pete Seeger’s clear, Alpine yodel, which I labeled “Grampa Yodeling,” thinking myself oh-so-clever. From there, I wove a twisted trail of music that included everything from Prokofiev’s Lt. Kije’s Suite to Hoagy Carmichael’s “How Little We Know” to Wendy Carlos’ electronic rendition of Monteverdi’s Vespers. It was a labor of love. It was a collection built of passion and desire, entreaty and adoration. In the wordless language of music, I wrote a sonnet, a dozen moments described in song. When I was done, I painstakingly wrote and decorated the track list, taking the same care as a medieval limner. Pete Seeger. Humpback whales. Love. As is the case with memory, some details are crisp and sharp and full of life, while others are faded or gone entirely. I have no recollection as to my beloved’s reaction to the tape when it was delivered. I do not know what she thought of it, whether she thought me clever or eccentric. Or both. To be perfectly honest, I cannot remember if I created the mix-tape when I was wooing her, or when I was trying to win her back, though I am fairly sure it was the former, as I remember the warmth of the summer sun through my third-floor garret room and the motes of dust that danced in the light. 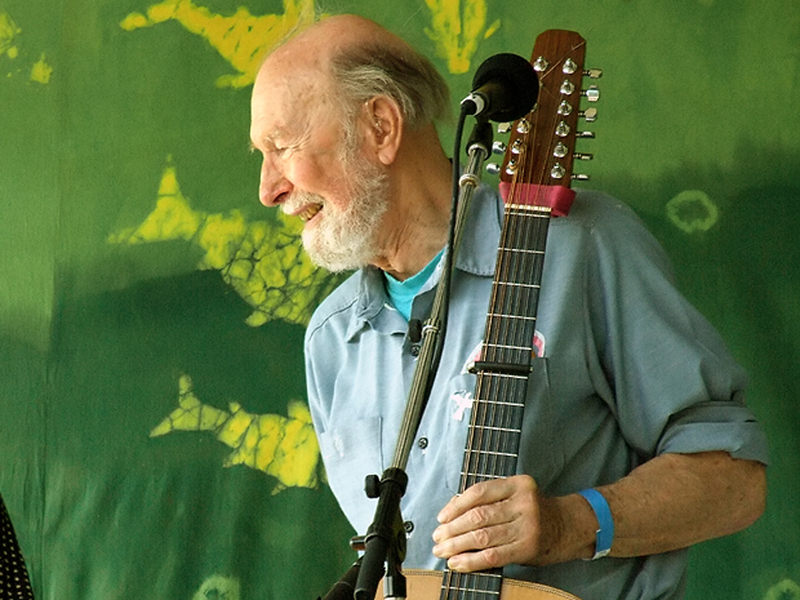 For his part in my life, I am thoroughly grateful for Pete Seeger. I will always remember him smiling, blissfully singing to the sky, as if the higher he sent his words, the farther they would reach, raining his joy down on more of the world around him. Thanks, Pete. You were grand. Ah, mix tapes. How I miss those. I’d spend hours painstakingly structuring the mood for upcoming parties, starting off slowly then cranking up the tempo. A lovely post. Thanks. Mix tapes _are_ a snapshot in technology, no? Like 8-track cassettes, you can peg a person’s age by their familiarity with the concept. i love this. what an elegant description of the musicians!